Both men were sitting on the forward hull of a Sky Ray, the Imperial code name for the xenos’ missile-launching tank. Two hours ago, the Tau vehicle had been skimming across the battlefield, sending projectiles of death into the Imperial Guard lines. Only a lucky hit from a lascannon had finally put the tank out of action. It had looked that way at first, Catillo admitted. As part of the 728th Regiment, under the command of Captain Stevrous Stark, they had advanced up the Hanui Valley. Their target: a xeno structure–slender and bright white–rising above the jungle canopy. The company had advanced into a firestorm of pulse rifle volleys. An early advance by the xenos on the right flank had been thrown back, but a team of Crisis Suits–one of the Tau’s more unique weapon systems–had soared out of the woods to play havoc with the Imperial line. 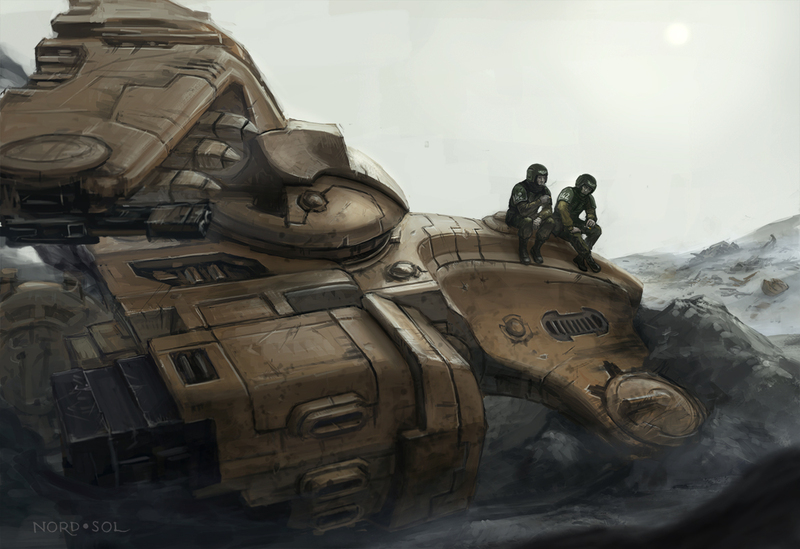 They even managed to immobilize the company’s single Lemon Russ tank, but it had its revenge: A shell of the tank’s massive Battle Cannon had struck the Tau commander–boldly out front in a bright white armored suit–and the xeno had disintegrated in a massive explosion that left no trace of him afterwards. That was when the battle had ended. With the Imperial center broken, Captain Stark had withdrawn a few hundred yards to consolidate his lines. The xenos had broken off the attack. With casualties high, neither side was eager to resume the fight, and it was clear the Imperial advance had stalled. Word was that the company would pull back to base and regroup. The field of battle would belong to the xenos, who thankfully appeared willing to let the 728th withdraw unhindered. TheGM: This quiet moment of reflection occurred on the afternoon of the Dar Sai: Battle of the White Tower, which was fought in Dar Sai’s Hanui Valley on 6 042 735.M41. Artwork, titled “Smoking After,” courtesy of Nord-Sol at DeviantArt (http://nord-sol.deviantart.com/gallery/).